JACKSONVILLE, FL. 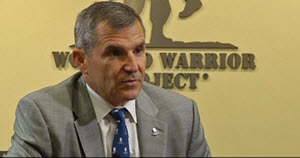 (August 31, 2016) – The new CEO of the Wounded Warrior Project® (WWP), Lieutenant General Mike Linnington, United States Army, Retired, is announcing changes to the structure of the organization to fulfill its mission to provide quality care and support to America’s wounded service members and veterans. Linnington, a career soldier with 35 years of service, is a veteran of Iraq and Afghanistan. A graduate of the U.S. Military Academy at West Point, he is a recognized leader who knows firsthand the challenges that wounded warriors face. Since his appointment on July 18, he has worked closely with the WWP leadership team to conduct an extensive review of the organizational structure and staffing model. “We are focused squarely on providing our nation’s post-9/11 wounded warriors with the best services and programs that when integrated with other government and nongovernment support, will address their current and emerging needs. Leading Wounded Warrior Project with rigor and discipline, while being transparent and fiscally responsible is - and will remain - a priority as we make organizational changes to better serve those who need this organization most. Our nation’s wounded warriors depend on WWP and they have my commitment that we will continue to fully honor and empower them.” said, Linnington. Redouble efforts to provide the most critical support services to wounded warriors and their families: Increase investments in mental health care for those with the signature wounds of these conflicts: Post traumatic Stress (PTS) and Traumatic Brain Injury (TBI). Engage with national and local community organizations: Increase synergy in relationships and partnerships with non-profit organizations, businesses, and government entities that serve warriors and their families. Improve accountability, transparency, trust: Continued focus on organizational efficiency and effectiveness. While WWP will reduce its total workforce, the organization will add staff in the areas of mental health, long-term in-home support, warrior engagement, and other roles essential to its mission. “We are strengthening our programs to better serve our warriors and their families, and will strengthen relationships with community partners in caring for our military community, as well as facilitating partnerships with organizations and businesses doing great work in the civilian sector. We owe it to our donors and our service members, veterans and their families, who have supported us throughout the years, to demonstrate the benefits their generous contributions make in the lives of our nation’s heroes,” said Linnington. As evidence of change, WWP has earned the GuideStar Platinum approval – the highest level of recognition offered by GuideStar. GuideStar is the world’s largest source of information on nonprofit organizations. As a standard practice, WWP will continue to share data that reflects the changes it’s making in the military and veteran community.